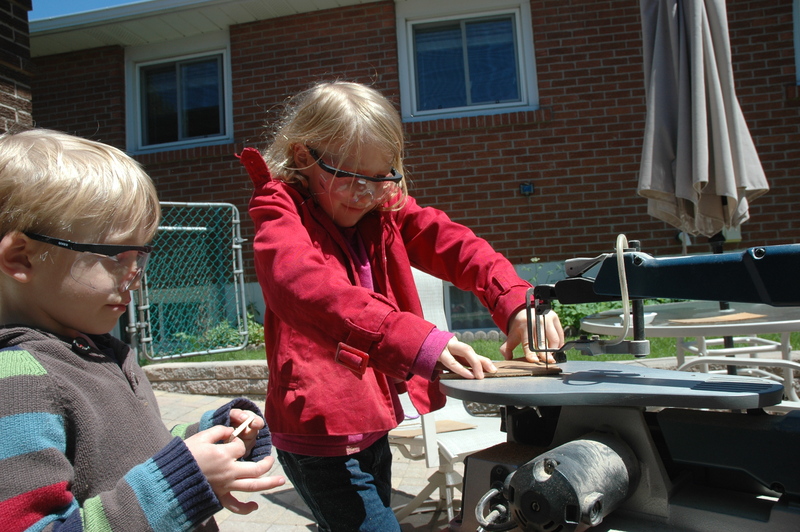 In my teaching of technology education and industrial arts at the grade 7 and 8 level I found that kids gravitated to the scroll saw. I had a nice DeWalt scroll saw in my school shop. At home, I have a small, inexpensive Ryobi scroll saw that I bought for my wife to use in her art studio. She has since moved on to other things and now it sits in my garage workshop. While I was looking for things to do with my grandchildren, aged 7 and 4, I thought I would bring it out and teach them how to use it. My granddaughter took to it like fish takes to water. She made a puzzle out of a square piece of 1/4″ plywood. When I asked her to tell me her favorite thing about the saw, she said she liked to make turns with it. She was so busy making turns that it was hard for her brother to have one. When my grandson finally negotiated a chance at the saw, he loved it too. He kept cutting 1/4″ plywood into smaller and smaller pieces. He then used these pieces to build a bed for his sister’s doll. 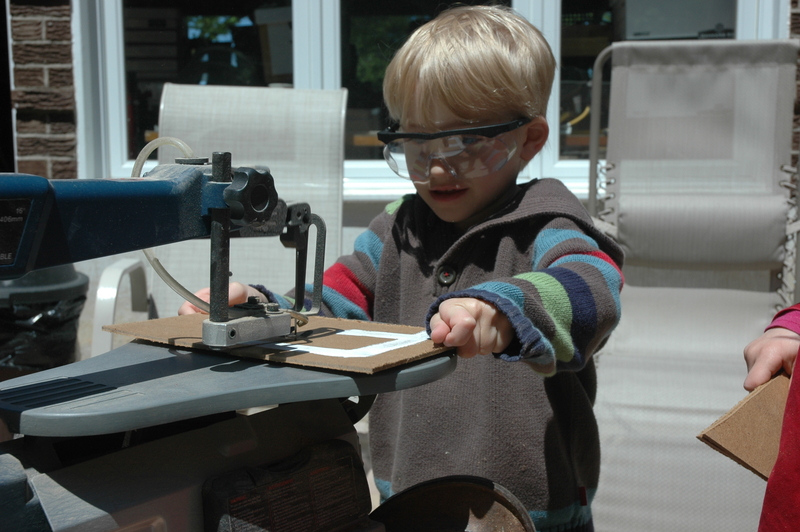 I like the fact that the scroll saw is relatively safe for a child to use~with knowledgeable adult supervision. It is quiet, so it doesn’t frighten children and it has variable speeds so they can slow it right down. 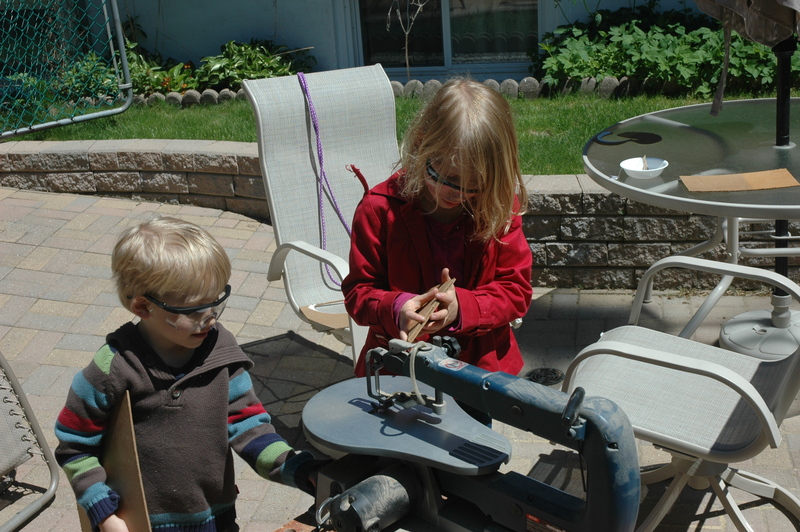 I impressed upon them the fact that their fingers had to be kept away from the blade, safety glasses had to be worn and that they could not turn the machine on for each other. This was a big challenge since they both wanted to help the other speed through a cut so they could have their next turn. They soon realized that the saw would be put away if they didn’t adhere to these rules. 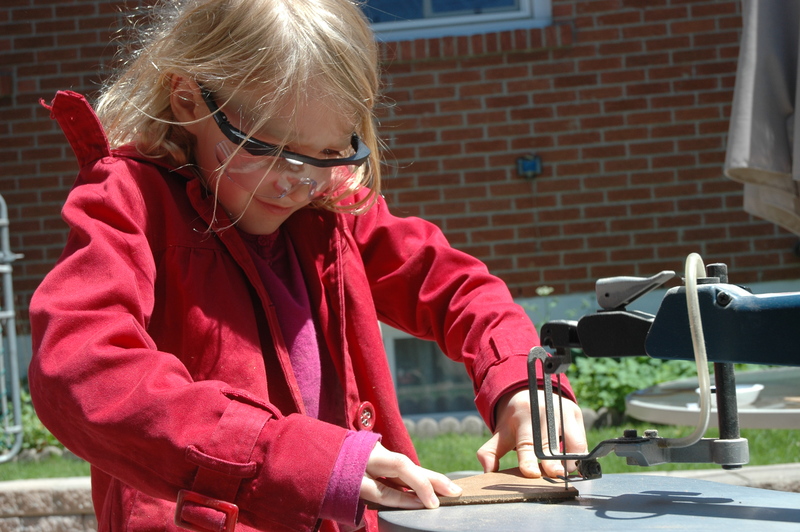 I was amazed to see my granddaughter figure out that an extra piece of wood could be used as a push stick if the piece she was cutting was too small and her fingers were getting too close to the blade. She is a natural. You can see the determination on her face. Sebastian turns on the scroll saw. Sebastian has lots of determination. Madeleine loves they way she "can make turns in her cuts." Madeleine definitely takes over while the ever (almost) patient little brother waits his turn. The projects were taken home and gifted to others before I thought of taking a picture of them. Fortunately, there is always next time.